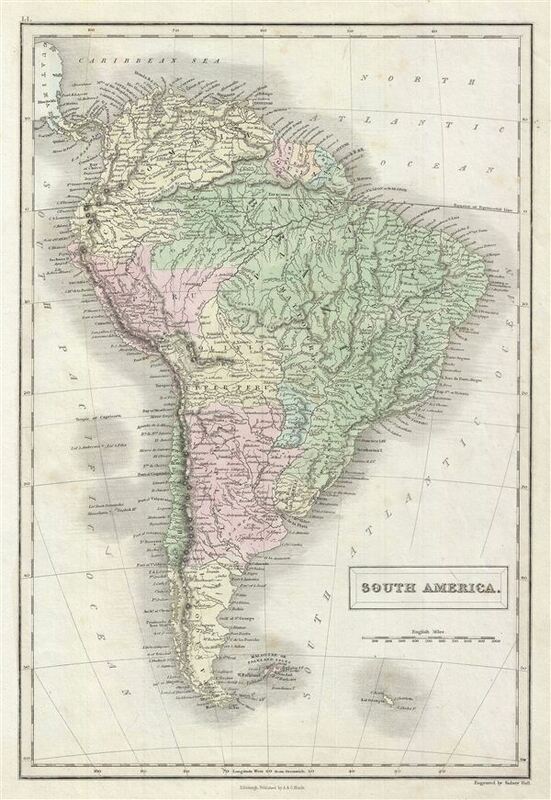 A fine example of Adam and Charles Black's 1851 map of South America. This map covers the entire continent from the Caribbean to Tierra del Fuego and from the Pacific to the Atlantic, including the Falkland Islands. Depicts the continent in impressive detail – especially the interior, which at the time was largely unknown. Throughout, the map identifies various cities, towns, rivers, mountain passes and an assortment of additional topographical details. Map is hand colored in pink, green and yellow pastels to define boundaries. The map is engraved by Sidney Hall and issued as plate no. LL in the 1851 edition of Black's General Atlas. Rumsey 2305.061 (1854 edition). Philips (atlases) 4334.